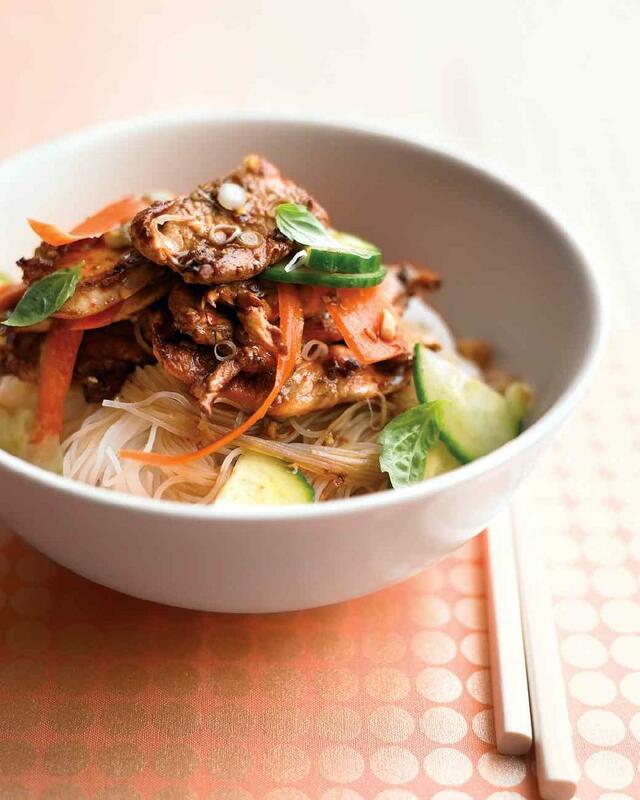 This one-bowl Asian meal is spicy, salty, sour, and sweet -- all at once. The secret's in the sauce, made from fragrant kitchen standbys. The salad has terrific texture, with crisp carrots and cucumber, tender noodles, and (if you like) crunchy peanuts. 1 Place chicken and half of dressing in a resealable plastic bag (reserve remaining dressing). Marinate at room temperature for 30 minutes (or refrigerate up to overnight). 2 In a large pot of boiling salted water, cook noodles until tender. Drain, and rinse under cold water to stop the cooking. Transfer to a platter. 3 In a large skillet, heat oil over medium-high. Working in batches, cook chicken (do not crowd skillet) until cooked through, 1 to 2 minutes; transfer to platter on top of noodles. 4 Top with carrots, cucumber, and basil. Drizzle with reserved dressing, and sprinkle with garnishes, if desired. 1 In a medium bowl, mix together all ingredients.